The heat wave should be over, ending five days of over 90-degree temperatures in most states on the east coast, so as the mercury drops and a lot of rain is expected, the trotters and pacers meet the weekend with a fine forecast, one that we hope will include some of our choices, especially the upsets. Captaintreacherous, rested and reportedly in fine fettle, hands over favoritism for the Adios Pace elims and probably next week’s finale, to Vegas Vacation, the colt so many people thought would topple the “Captain” but, of course, could not. The Captain takes more time off, time he has earned by taking the division’s biggest early season stakes. The Yonkers Trot eliminations are covered on the Hambletonian Trail at the exclusive blog. Grand Circuit stakes for many eligibles are also covered there. winSpires offers special bonuses for Hoosier Park throughout the harness meet and this weekend there is a 15-percent Pick-4 bonus. Check out the Hoosier details here. With Captaintreacherous resting until August, 18 colts will compete to qualify for the $500,000 Adios Final next week. Two eliminations are slated onto fhe Meadows’ July 20 race card. Sunfire Blue Chip, off a game third-place effort in the Max Hempt Final, is the favorite heading into the first elimination. Word Power is also coming off a fine effort in the same race, battling with Sunfire Blue Chip from the half-mile to the top of the stretch. He was parked through fast fractions and held on to finish fourth. Although he drew the far outside in this elim, he should get off the gate well and be positioned to make a move to the top towards the end of the mile. Vegas Vacation headlines elim two due to a runner-up effort to Captaintreacherous in the Max Hempt final, closing ground quickly. Also in this elim is Sunshine Beach, the Meadowlands Pace elim winner that finished third to Captaintreacherous in the final. Looking the best coming into this race is Resistance Futile, off a fourth place effort in the Meadowlands Pace. Originally in the Blair Burgess barn, Resistance Futile is now in the hands of conditioner Aaron Lambert. The colt has been showing tremendous improvement in his last three starts with the addition of Lasix. He drew perfectly to get off the gate, be positioned near the lead and begin his pursuit at the half-mile mark. Older trotters and mare pacers are on highlight this Saturday night at Mohawk, with the $543,000 Maple Leaf Trot and the $323,500 Roses Are Red Final. Linda Toscano is back with another favorite in this year’s edition of the “Maple”, Market Share. Jeff Gillis’s star trotter Mister Herbie is also making a return to the stakes, looking to defend his title. Jimmy Takter has two trotters in this year, world champions Uncle Peter and Guccio. These four will be the ones that are bet the heaviest. The public won’t key on the oldest trotter in this race, making his sixth-straight appearance, Arch Madness. 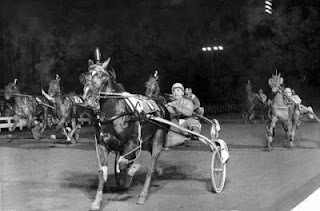 Coming into the year, Canada’s richest trotter was not at his sharpest, finishing off the board in his first starts. He left North America off a third-place finish, with Wishing Stone and Sevruga taking the first and second slots. 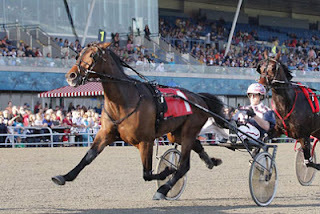 Arch Madness began his trail of improvement in the Elitlopp, finishing fourth in his elim, then being parked three wide through the final turn to finish second in Sweden’s signature race. His first start after the Elitlopp was not impressive ( post 10 and finishing eighth). He made a big comeback off that effort, setting monstrous fractions on the lead in a Preferred at Pocono Downs, where he lost by ½ length since Uncle Peter sat a pocket trip. Arch Madness drew post 3 in the Maple, which should greatly help for a good trip. Of course, the probable favorite in this race, Market Share, will be a huge threat, so we won’t be surprised if he beats us. Arch Madness will, however, offer value, which is good since he is peaking at the right time to show superior, aged experience, which could mean that his sixth Maple appearance would be a winning one. Elimination winners Anndrovette and Drop The Ball are the two top contenders for favoritism in the Roses Are Red Final. Anndrovette is known for her high speed, as it was truly displayed in the Artiscape Final at Tioga, where she paced monstrous fractions on the lead. Although, there isn’t much speed that will likely pressure her into this race but the best trip for any of these mares can result in defeat for Anndrovette. That being said, one mare in this field has shown tremendous improvement in her first start off of a layoff and drew perfectly here for a perfect trip. All those characteristics apply to the mare from the rail, Monkey On My Wheel. Looking back to her three-year-old campaign, Monkey On My Wheel got a perfect trip in the Breeders Crown. Idyllic set fast fractions on the lead, under no pressure, while Monkey On My Wheel got a pocket trip. She made her move to the front at the apex of the far turn and drew off into the stretch. All other rivals were giving chase and cut into the deficit slowly but Monkey On My Wheel crossed the wire first, a three-year-old filly champion. Now five, she seems to have not lost a step. She was a beast during the winter, winning the Woodbine Preferred week after week. She took a needed break and qualified twice at Mohawk, improving in her second qualifier. She got away third from the rail in the Roses Are Red elim. Anndrovette dictated a hot pace with Camille in the pocket. Monkey On My Wheel came from third on the outside and made the move that won her the Breeders Crown, except she was battling through a fast three-quarters time, going in :27.3 (she paced it in :26.4). It is not a surprise that she ended up fading but coming into the final she has the rail, speed to her outside and everything is playing well for her. She is likely to get a better trip in the final and can win making her second start off a three-month layoff. The Battle of Lake Erie is the feature at Northfield on July 20, with some of the stalwart older pacers from the division’s second tier coming from the east to participate in the mile on the Flying Turns. Aracache Hanover may surprise no one wagering on this event, as he has been sharp with the first tier of this older set and likes the Flying Turns. But Foiled Again is here and he brings with him an ink-filled resume with half-mile wins in stakes. As well, he has gotten most of the sport’s attention lately and that always influences the betting pools. Still, we like the mild upset, even if “Aracache is a second choice here, since there are major knocks on all of the horses from post 3 to post 8. The $111,250 Lawrence B. Sheppard Pace is one of the first major frosh stakes and a mile to get a peek at future sophs we may be dealing with next season. A full field of eight goes to post at Yonkers on July 20, five of them still maidens. Two colts here are worthy shots to take on the obvious choice, Western Conquest. The first is Forty Five Red, a son of that great racetrack performer If I Can Dream. Readers of our blogs through the years know how we profited from that tough colt and now his progeny begin to appear in top races. “Red” goes in the third race of his career, having won his maiden and been second against winners. He should be improving and this would be a great mile for him to show it. Cheyenne Rei is a stallion stationed in Ohio and has done well with crops there, though his greatest racing accomplishments were in the east. Disarrei is trained by the sire’s conditioner, Robert Siegelman and the connections to this colt are his partners in racing. We have to go on sheer promise with a lot of two-year-olds and this one has the bloodline to try and catch a big return early. While you are playing Hoosier on July 20, see if the following contenders of the Indiana Sires Stakes (INSS) finals can assist you, especially in the special TwinSpires bonus for the evening--Check out the Hoosier details here. Rockabye Glory is weighed down with the 9 hole or she will find it pleasingly useful in the long stretch drive. Don’t worry about her “slow” best win time, it won’t matter in the context of this class. It’s hard to believe anyone can come too close to Paco Labrook here but beware of Freddyscooter. Muscleshooter could upset here. He likes to win and that may be motivation enough to make his sterling season’s stats shine even brighter. Race for race, Always About Katey has been dynamic against all types of state-breds and should be a bargain to bet upon in this group. Just A Steady Hall has won 50 percent of his starts so far, is in the Ron Burke barn and won’t be favored, all of which are reasons to include him as a major character here.